THE following is what is reported to have been said recently by a standing water and sanitation minister in the midst of the ongoing water shortage in several parts of the country. It’s not clear whether it was said in jest or in earnest, which would be in line with the same minister’s well recorded and strange utterances of recent weeks. Some will recall that this is the same minister who, agreeing with sentiments expressed along the same lines by one Collen Maine (ANC Youth League president) and one Dudu Myeni (chairperson of the Jacob Zuma Foundation and South African Airways) – both notorious in their own rights – told party supporters not to be bothered by the country’s recent sovereign credit rating downgrades. “If the rand falls,” she told them amid the cacophonous chanting of misplaced revolutionary slogans, “we shall simply pick it up again and move on.” Going by the continued singing and dancing, it seems safe to conclude that either her audience did not understand what in the world she meant, or that they did not care. This time, commenting on a matter that falls within her ministerial mandate – the ongoing water shortage in the Cape – the same minister had this to say: “… the opposition must not make a big deal of this situation. Our forefathers would often go for weeks, if not months, without bathing or drinking water; I believe we can also do it. But to her credit, more recent reports show that the minister has finally come to her senses and conceded that the drought problem is more serious than meets the eye. All of this seems like déjà vu to me. It’s not too long ago when South Africans had to be woken up from the slumber of low electricity rates and habitual wastage by forced, regular outages. Prior to that, many of us saw nothing wrong with leaving office lights on all night, even when there was nobody around. We did the same in our homes by leaving lights on for hours in rooms that were not in use, and by generally using power with total carelessness, as if there were plenty more where it came from. All of this changed when the power outages and increased rates began to hit where it hurts the most: in our shallow pockets. A good sign of this was when people began to call in to radio talk shows and write to newspaper editors complaining about lights left on all night in large office blocks, and street lights that remained on well into the day. It seems like we’re there again, this time forced by a combination of poor water supply – it is no secret that South Africa is a water scarce country – ageing infrastructure which is of bad quality in many areas, and sheer wasteful water use emanating from bad habits and attitudes, including arrogance. There are still too many instances of wealthy people who seem to believe that because they pay for their water, they can use it any way they like, irrespective of the bigger picture. Upon hearing and reading media reports about the water shortages facing the Western Cape, American Culver Van Der Jagt wasted no time in organising a ten-day visit to come and see for himself. This was prompted by his experience of and involvement in finding solutions for the drought that hit his native California over a five-year period. During his visit, Van Der Jagt spent a great deal of time meeting and speaking to many players in private and government sectors and visiting several Western Cape dams and affected communities in places like the Imizamo Yethu informal settlement in Hout Bay. He also inspected toilets in private homes and several public facilities, to gauge the extent of the crisis. He listened to leakages, changed valves for free and potentially saved money in water bills for the people whose toilets he fixed. He came to South Africa with a bag filled with valves which, he believes, do a better job the ones we have in our systems. “I know that there are discussions about seeking supply-side solutions, such as desalinating sea water, and putting pressure on government to come up with quick solutions,” he told me, “but desalination is a hugely expensive route to go, attractive as it seems. “Your problem is aggravated by the bad, ageing infrastructure, especially the underground asbestos pipes, and leaking toilets because of ineffective, poor quality valves. Many of the valves were specifically designed to be silent, making it hard to hear the noise made by leaking water. They’re responsible for much of the unaccounted leakage. Billions of litres of water are lost in this way every single day,” he lamented, almost teary-eyed. In Van Der Jagt’s view, the horses have almost bolted. The very low dam water levels, estimated at 11% in some cases and less in others, do not make the situation any better. The winter rains, if they come, will only provide short-term solutions if we fail to effectively deal with infrastructure and the demand side issues, such as our habits vis-à-vis scarce water resources. 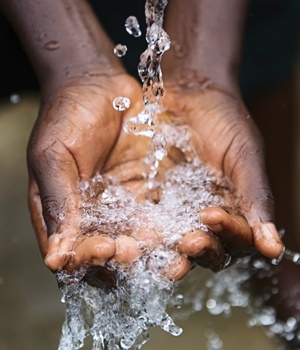 With a warning in 2015 about the country’s national water security that “between 37% and 42% of potable water is unaccounted for; lost through leaks, wastage and illegal connections” (the international average water usage per day is 173 litres while South Africans use 61.8% more water than the world average! ), it is time for South Africans to start a serious, nationwide, discussion about the real state of our country’s water resources, and how this stands to impact on socio-economic development. Even here, we have to connect the dots and be sure to appreciate the extent to which our water crisis, if not dealt with holistically, will hurt any prospects of creating an inclusive economy.